For many weeks we have been seeing flocks of the same birds in the fields where we walk, we were never able to see them close up to clearly identify them, but over the weeks we have watched, studied and noted their characteristics and markings gradually working out what they were not! 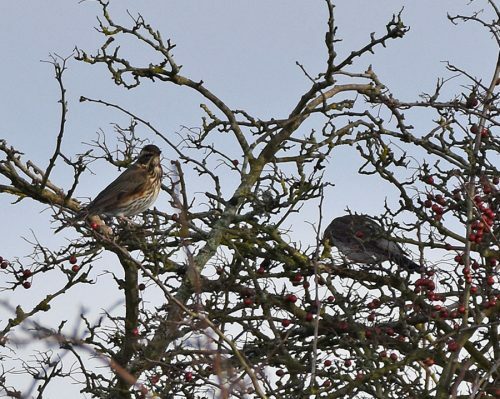 Finally today several flew from a bush in front of us so we could clearly identify them from our "list of possibles" as Fieldfares, a lovely looking bird which by putting out fruit over this winter we hope to entice into our garden. So one more feathery friend to add to the growing list of birds we can recognize, learning all the time, not bad for a couple of olduns!!!! I've got a flock, I think it's mixed blackbirds & different thrushes in the hedges of garden & field. The light hasn't been good enough to make out the colours. 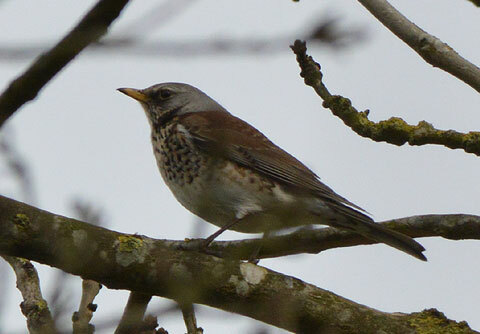 I do think fieldfares are handsome. They are quite shy though - it takes hard weather to bring them near. Interesting how, when I put out apples in the grass (after I'd cleared snow away) the field fares came but spread out. If I fed starlings they all swooped down and didn't mind being close. We have had flocks of fieldfares in the field at the bottom of our garden, but not seen any this year. They're a devil to photograph, there's 200 plus in the trees alongside the field at the end of the Lane, they have a habit of always being two trees ahead of you! Actually got one though ! There's a strong liklihood there's a few Redwings in amongst yours, part of the same Thrush family and live alongside each other well. I've still to get a definitive photo of one.. Both are RSPB Red listed, so always great to see them and anyone else having some close by. Our previous house had cooking apple trees and they used to come down in their dozens for those, not sure whether they would get upset tummies though, bit sour. I like Fieldfares in respect they make a noise, uplifts winter a bit. The 200 or 300 which were around November and December seem to have moved on, same as last year. I believe they migrate away altogether in March. I saw two on the field the other day though, plus a few Redstarts tagging along. 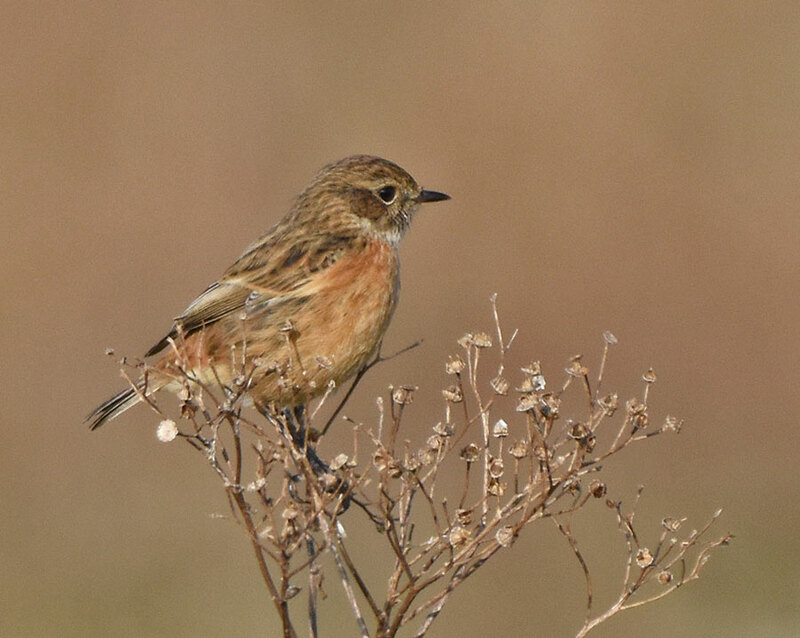 Richard wrote: I saw two on the field the other day though, plus a few Redstarts tagging along. 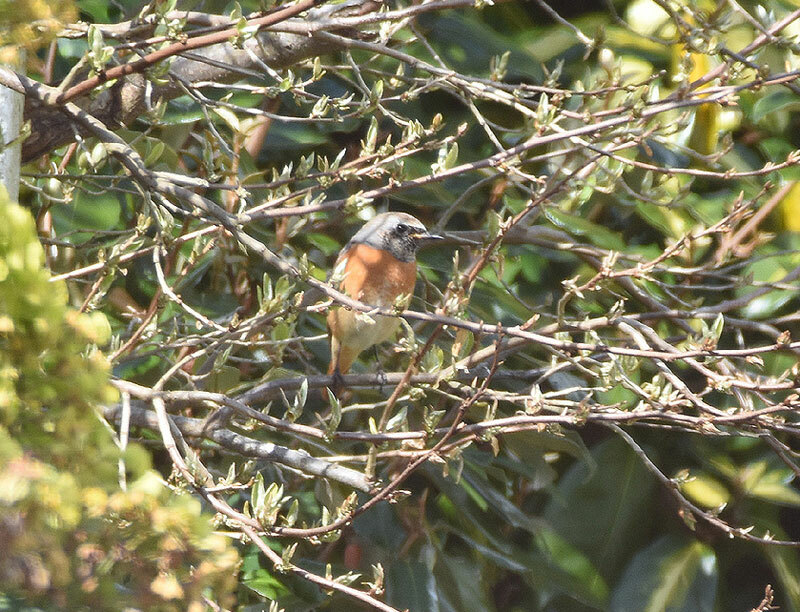 I've never seen a redstart - seen plenty of redwings. I apologise, should have said Redwings. I've seen Common Redstarts around Folkestone and Dungeness. 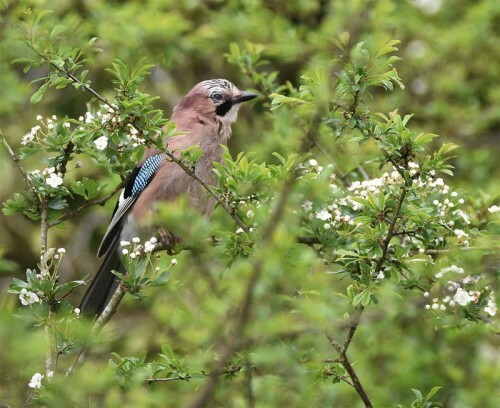 Here's a Jay in Spring.. 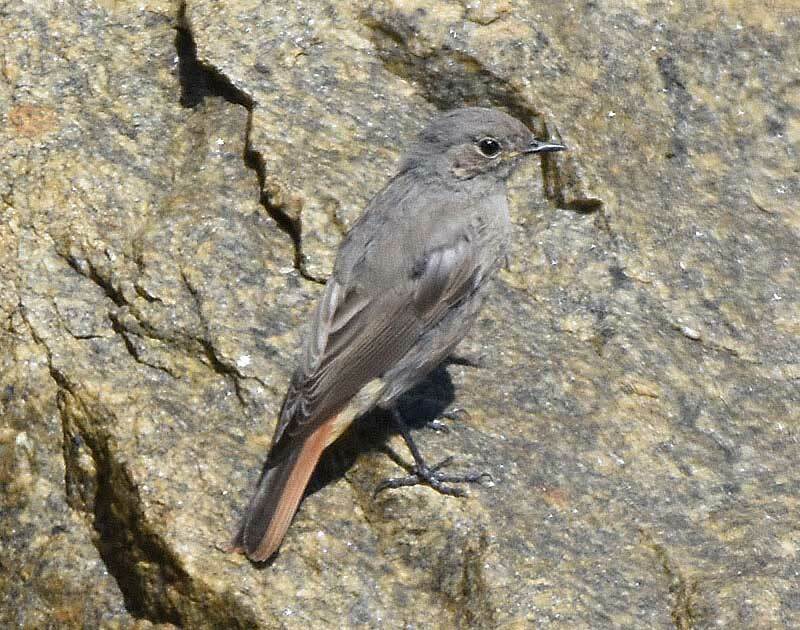 Thanks for the pictures Richard, the one of the redstarts has just helped us identify the little birds that have been flying in and out of the barn as Black redstarts, stunning little things. 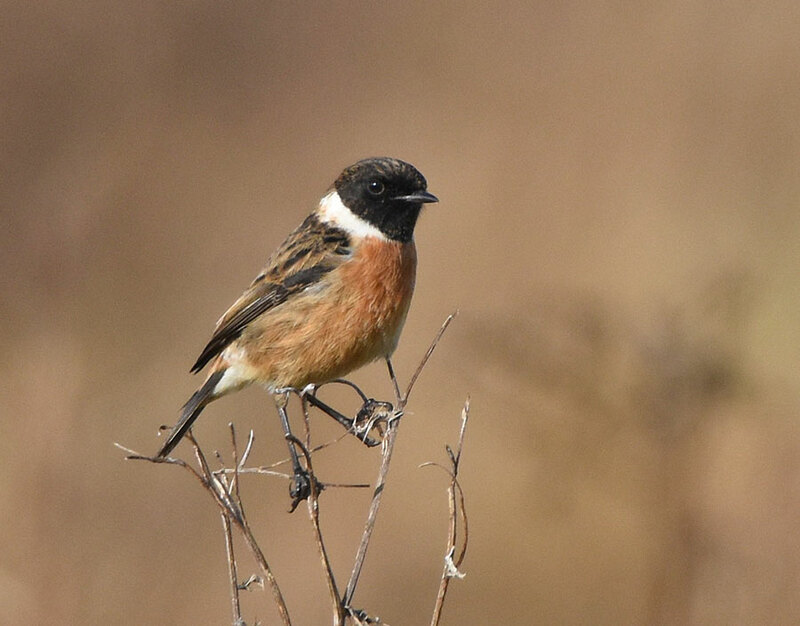 or could be a Stonechat Trev? These have a lovely deep black colour running from their head to half way down their back also black wings, their lower back is a coppery? colour extending to their tail. If I manage to get a photo I will post it on here for a (hopefully) positive id but rather cold at present out there during the day!! Could be Black Redstart Trev..